It always seemed to be a Halloween Hail Mary, a last minute marathon of cutting, pinning, and furious sewing. As kids we loved it. We all got to play together basically all night long. We could do what we wanted for the most part because our moms were frantically trying to finish elaborate costumes in time for Halloween. I never understood why they were so frantic. No matter how much time was left and no matter how close they came to the deadline, we always had the best costumes to wear for Halloween. As kids we were never worried. We knew our moms could do anything they put their mind to. Now that I have my own kids and grandchildren, I totally understand how frantic they were. Failure at Halloween means tears from a disappointed child. As a mother of four and grandmother of eight, I now know that’s like Kryptonite to the heart. Something you want to avoid at all costs. I remember the year my then 6 year old had her heart set on being a pack of gum. I spent two weeks gathering materials and working on a costume. I’m NOT a seamstress like my mother so I wasn’t looking forward to it. Two days before her party at school, she decided she wanted to be “Word Girl”. I ran around the house pulling together whatever I could find that might work. Believe it or not I had footie pajamas and they were RED. I found an old bike helmet and covered the Dora logo with construction paper. I added a gold belt from a previous year’s super girl costume and glued on a construction paper star, red rain boots, red winter gloves, and a towel for the cape. I have to give my mother credit for most of the costumes over the years. She’s done some amazing ones. Aladdin and Jasmine for my two oldest children one year, Maid Marion and Robin Hood another year. Countless others including costumes for school plays and talent shows. And now she continues to make those memories for my grandkids, her great grandkids. That’s Landon in the photo above. When we asked her to make a penguin costume for him, she said okay sure. Little did we know she was thinking penguin, the animal. 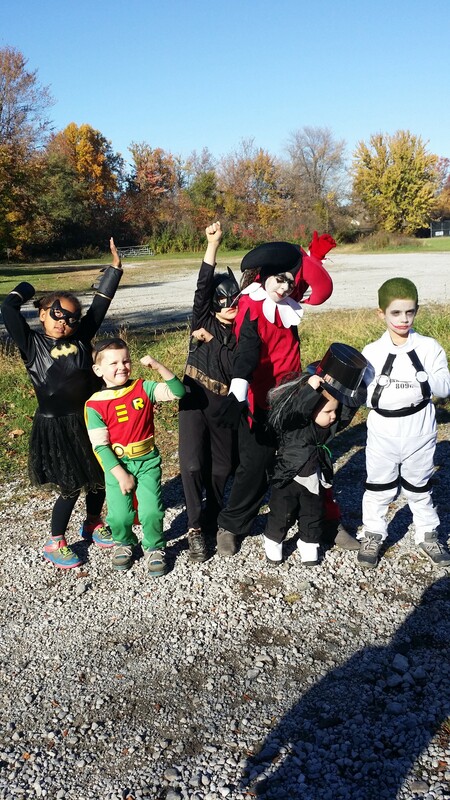 But the bigger kids were all going as characters from the Batman movie. Harley Quinn, Batgirl, The Insane Joker, Batman and Robin. But they decided they had to have the penguin too. When we showed mom the picture of “The Penguin” from Batman about a week before Halloween, she said “Oh! That’s not what I had in mind at all. I better get started!” She went to several thrift stores to find the pinstriped shirt and the suit jacket and modified it to fit and so it had the “tail” in the back. She made the shoe spats to fit over his shoes. 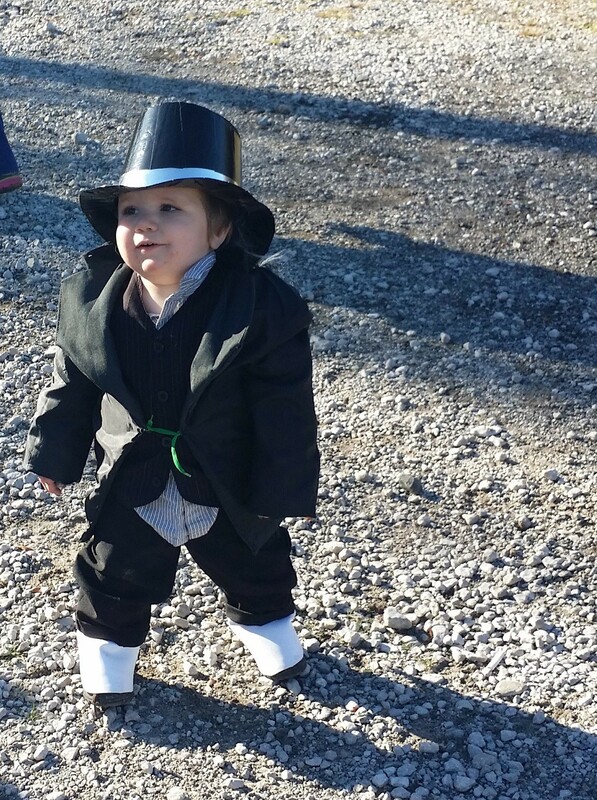 She re-purposed a purple top hat from another costume and used duct tape to change the color to black. So she did it. Another Hail Mary Halloween. This year the kids are all dressing up as characters from the Nightmare Before Christmas. Yep. Jack Skellington, Sally, Lock, Shock, and Barrel. Even Oogie Boogie. 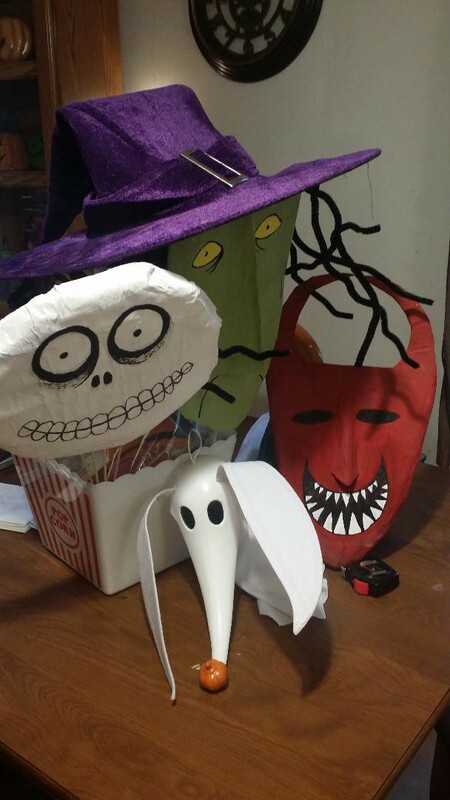 My grandsons’ mom started gathering materials two weeks ago and making paper mache masks. Handmade Lock, Shock, and Barrel Masks, Zero is store bought! She’s putting finishing touches on the Oogie Boogie costume today so it will be ready for tonight.